Boredom affects each and every one of us differently. I, for one, can watch hours and hours of bad shows while eating about everything that is edible. My friend Radu wastes away his life on 9gag, Dana takes naps, and my roommate cleans the entire house just whenever she’s bored (our place is constantly spotless :D). I have also met someone who would arrange the letters that come in those ABC cereal boxes alphabetically, someone who learned how to play guitar, and at one point I encountered a professional skater who started skating because he was so bored one Tuesday afternoon that he took an old skateboard out of the closet and he just started skating. With all these people around me and all their interesting habits, I thought I knew every possible way to cope with boredom. And then I met Ben, the man behind Ukulele Road Trips. Not only did I stand corrected, but I stood amazed at how beneficial can boredom be, both for yourself and the entire world. “I like writing songs, I like travelling, I like culture, I like discovering and also I was really, really bored, so I decided to leave France and start a big musical adventure in which I’d ‘read’ people’s cultures, write songs and share them on my blog with the world, the world being in the very beginning 2 or 3 people in my family and 4 friends. And that is how Ukulele Road Trips came to life”, confessed Ben. He’s a 27-year-old French guy who mid-March 2015 decided to leave France and start exploring the countless treasures of Eastern Europe. 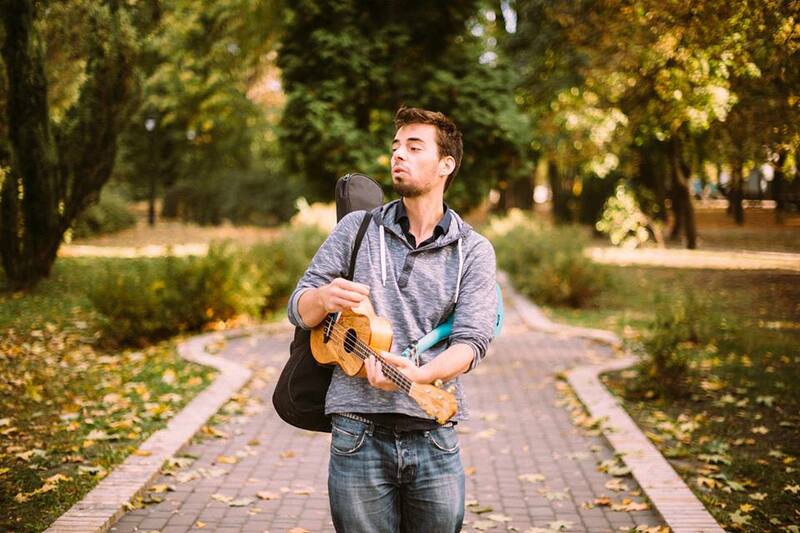 And because happiness is only real when shared, he started the Ukulele Roadtrips blog, in which he posts songs, articles and podcasts from the places he visits. He started off in Bulgaria and then he kept on moving North to Romania, Moldova and then Ukraine. He was on the road for over a year, having spent a considerable amount of time in each of these countries getting to know their people and their culture by hanging out with locals, asking them questions, listening to their stories, acquiring knowledge which he later sends to the world through his blog. He wrote a song in every place he went to trying (and succeeding) to catch a glimpse of that spot’s heart. This sharing part, especially when it’s in the form of song, involves a rather complex process. “It takes too long to have a song ready from scratch: coming up with the idea, the melody, the chords, the research, the lyrics, finding a nice place to record it. 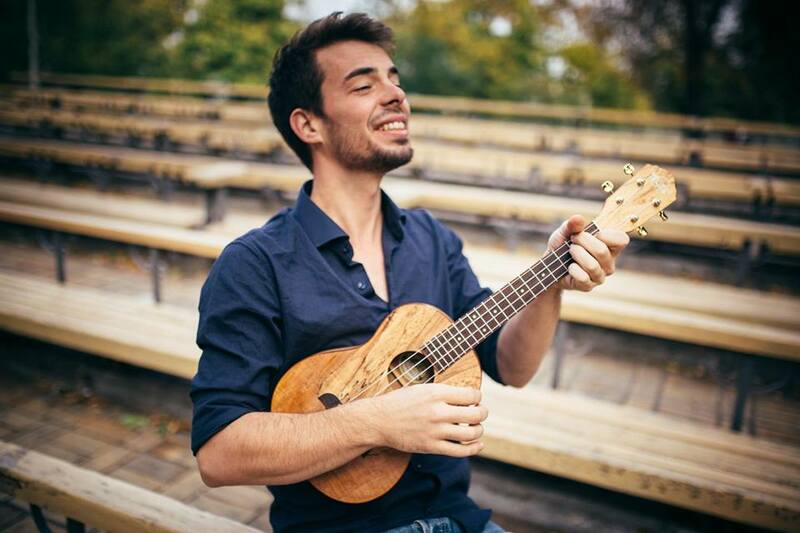 Plus, the ukulele is not such a versatile instrument, so writing a song that can be sung accompanied by a ukulele is part of the challenge.” But however time and energy consuming the artistic process might be, his passion and interest keep him going. Tangible proof of that is his Bulgaria album that’s already on the market and the Romania album that he’s currently editing and finishing up. He is also very familiar with Romanian history – his songs about Vlad Țepes (Don’t call me Dracula) and Ștefan cel Mare should be considered for teaching purposes. After all, he does manage to make history fun while keeping it accurate. Full attendance at history class is now more possible than ever. It was imperative for Ben in order to survive in Romania to learn at least a few phrases. He thought about them for a second and then, with a serious face, he started counting them down.“’Cu de toate fără murături, mulțumesc’, ‘cu tine vreau sa îmbătrânesc’, ‘te iubesc’”. He surely chose wisely what to learn. There was another thing about the language he added with a wide smile: “I love the sound of Romanian. Women speaking in Romanian is too much for me to handle, I’ve fallen for that already. I’m back in France now and who would’ve known – girls talking in Romanian is one of the things I miss most.” All the more reason to come back. With his contagious smile and passion-filled eyes, he smiled and waved goodbye. I did the same while thinking that if the world were ever to change for the better it would be precisely projects like Ukulele Road Trips and ideas like Ben’s that would galvanise the change. Let’s smile and wave and keep our fingers crossed.